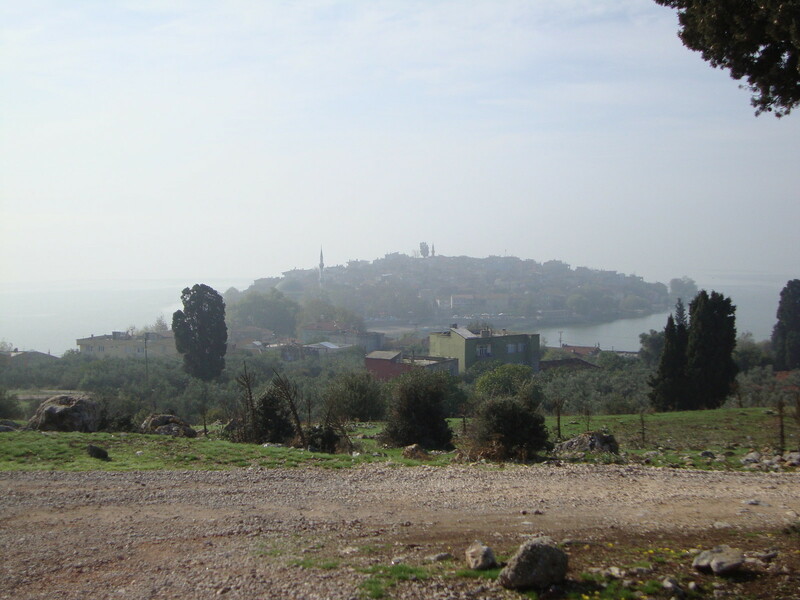 The town of Golyazi, with Ulubat Lake in the background, seen from the site of the former Greek cemetery. 20th century Turkish nationalism continues to offer Western journalists its fair share of dwindling ancient minority stories. There are the Greeks of Istanbul, the Jews of Antakya, the Suriyani of Mardin and the Armenians of Vakiflar, just to name a few. All powerful stories - and tragic - but read together they also suggest a tendency to fetishize the dying at the expense of the living. Maybe America, as a nation of successful immigrants, is particularly susceptible to a guilty fascination with the plight of those who remained behind. But we of all people should realize there is another side to the story. The town of Golyazi lies on a lakeside promontory in a particularly beautiful part Anatolia just west of Bursa. Abandoned by deported Christians in 1923 and resettled by Muslims deported from northern Greece, it stands as something of a monument to both the cruelty and dislocation of the Turkish-Greek population exchange as well as the endurance of those who survived it. Golyazi has two graveyards, one destroyed and one still standing. The first evokes the loss of those deported, the second evokes the meaning of their post-deporation lives. When I visited Golyazi with my father in October 2013, we had to ask a few people in order to find the site of the town's Greek cemetery. Once we got there we had to ask again to find out if we were really in the right place. The former graveyard was a field of bare, rough gravel on a hill overlooking the lake, marked by a few pomegranate trees and the husks of their dead fruit. Like all to many physical reminders of Anatolia's Christian inhabitants, it had been destroyed by the government, apparently bulldozed at the orders of a local mayor in the 1960s. All too often these acts of destruction accompanied international conflicts, over Cyprus usually, in which minority populations and their history became victims in Greece and Turkey alike. Destruction often proceeded in a retaliatory fashion, Turkey demolished Orthodox churches, Greece converted abandoned mosques into stables. An old shepherd, at work among the weeds and rocks, confirmed that this was the Greek cemetery, then began to tell us about its destruction. He was, in fact, was eager to express his outrage at the state's disrespectful treatment of the dead. He said he had insisted at the time that it was immoral to tear up a graveyard whatever the faith of the people buried there. And, he continued, though those who ordered the destruction never admitted their error, his view had subsequently received divine confirmation when, some nights after the work was finished, villagers saw a spectral blue light descend on the hilltop. After hearing his story and admiring the view out over the lake, we walked down the hill to the Muslim cemetery, sprawling near the surprisingly well preserved remains of the Greek orthodox church on a road into the village. 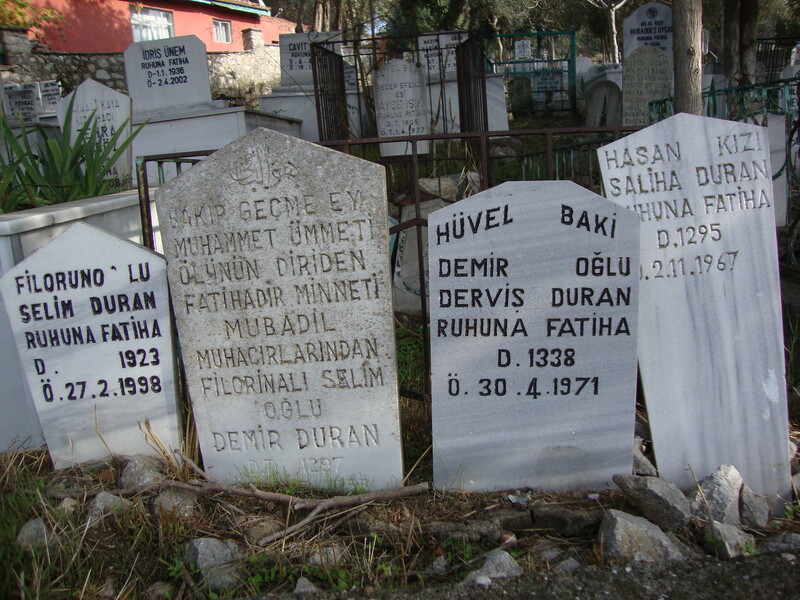 The dates span Turkey's conversion from the Islamic to Latin calendar, though Demir Duran's oldest son seems to have given his birthdate in Latin, the younger son in Hijra. But even with a rough estimate the advanced age of all the deceased becomes apparent. Selim Duran, for example, died at 75. As Turkey has begun wrestling with the legacy of a century of nationalism, it is increasingly common to hear condemnation of the the population exchange that brought the Durans to Golyazi. Yet there is also something ahistorical, about this condemnation, almost a refusal to recognize the full extent of the 20th century's tragedies. Among other things, the population exchange is easier to talk about than the fate of the Armenians. There is a neat reciprocality to the exchange that makes makes nationalism the villain, not one particular nation. But this is hardly a story unique to Turkey. In the history of much of 20th century Europe and the Middle East, deportees were the lucky ones. Here, by the lakeside, were the graves of an entire family that, after living out full lives, had been buried together, in graves laid out side by side, overlooking their new home. This was a fate reserved for all too few people in the last century.